And David wants in. He wants Steelheart, the Epic who is said to be invincible. The Epic who killed David's father. For years, like the Reckoners, David's been studying, and planning, and he has something they need. Not an object, but an experience. Our story begins with young boy David and his father. David has seen something that nobody before, or since has. David has seen an Epic bleed and not just any Epic, it was Steel Heart. The event referred to as Calamity, brought about a change never seen on Earth before. Ordinary humans somehow gained extraordinary abilities, creating illusions, predicting the future or being able to fly. Those deemed Epics, live on the surface while ordinary humans are living in an area called the Under Streets with the rest of the non Epic population in New Cargo. David is a mysterious character. Readers will learn his motives within the first few chapters and although his character seems naive at times, his motivation and determination knows no bounds. David has determined where a powerful Epic will be assassinated ahead of time and is there to witness the event, obsessed with the Epic population is not only dangerous but will put David's life at risk. The hit to be carried out by a band of underground rebels known as The Reckoners, a group David is desperate to join and prove his worth as an asset. 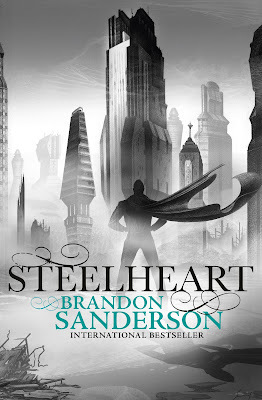 Steelheart has a strong Science Fiction element, realism and a vivid dystopian future driven by a totalitarianism style of world building. As the reader is introduced to the band of colourful characters, all with secrets of their own, David's character begins to develop as his journey progresses. David has always struggled to survive, working as a child and now orphaned. His mother having died years prior, then Steel Heart having killed his father when David was still a boy. Now at seventeen, David is armed and the self trained Epic hunter wants revenge. The Epic population are seen as superior, dominating ordinary humans while not held accountable for their actions. They're villainous, self serving and see humans as barely being tolerated. The Epic is a new breed of superhero, heinous villains who see the ordinary population as disposable mundanes. The audiobook was well narrated, it lures readers into the world of New Cargo and it's tyrannical inhabitants. It's captivating and brilliantly written. Brandon Sanderson has reinvented the symbolic superhero, blurring the lines between heroes and villains while engrossing readers with an intense and unique storyline. I love this book. The shame is that I haven't read the second and third installments. Thank you for sharing your thoughts, Mr. Kelly. I wish I can convince my husband to read this one, too. But he doesn't have the patience for fiction, unfortunately. Lol. That's too bad Joy. My husband listens to audiobooks on the way to and from work and he really enjoyed the series. He's now on his second audiobook Sanderson series. I can safely say he's a fan. Haha, I'm so glad you have your hubby chime in! I was thinking of having mine write a couple of reviews for my blog, too! That's would be amazing Ali! The hubby and I read different books usually, unless I've read something I know he'll really enjoy. But he typically likes science fiction, and with none of that romance in there either. I haven't read this series, but seeing how much he liked it, I'm starting to reconsider. You really do Frannie. he's such a fussy reader and if he loved it, you know it's an incredible series. I'd love to see what you think of it. Thanks for sharing your thoughts! I'm glad to hear you liked this one. I really do want to check this book out. It sounds great. He's really enjoyed the series Lauren, would love to see what you think of it too. I've heard that this audiobook, and the rest of his books, are really good. I have a few of them on my wish list. This isn't my usual genre but I'm a sucker for a good audiobook! The hubby loved them and has moved into his other young adult series now too. He loved the narration, which is usually a big hit or miss for him when it comes to audiobooks. He did a good job didn't he. I wish he was that well spoken and articulate at home, besides the musical flatulence. I do hope so Sarah, it really does sound like a brilliant series doesn't it.